Finally, the 2018 fantasy football playoffs are here. As I said last week, for those of you who made it, congratulations. For the ones who didn’t, better luck next year. But hey, don’t get discouraged. 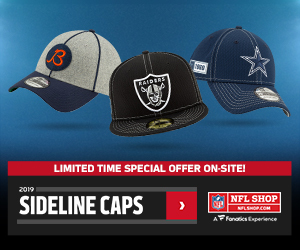 With all of the injuries, holdouts, and suspensions there were to deal with this season, some of has had way too many hurdles to overcome, including myself. While I did advance to the fantasy playoffs in some spots, I play in a lot of leagues and wish I could have done better overall. For me, the 2018 season was by far the worst one that I ever had to deal with on the injury-front in over 16 years of playing fantasy football. Across double-digit leagues, I had rostered Jimmy Garoppolo, Jerick McKinnon, Marquise Goodwin — Goodwin’s disappointing year was due to a mixture of injuries, plus, the fact that Garoppolo was out — Derrius Guice, Rex Burkhead, Hunter Henry, Marshawn Lynch, Cooper Kupp and Bilal Powell. Just to name a few. As you can see, even the self-proclaimed experts have their down years. So for all you newbies, don’t give up. And for everyone in the dance, great job. While I’m sure a lot of you rolled up to this point, there are also so many of you out there who not only overcame the obstacles but also made some outstanding start/ sit calls and waiver wire pickups along the way. While I love my dominant teams, I also cherish the ones that just sneak into the playoffs and go on a run. I can only hope that my sleeper calls helped you in some way this season. Now without further ado, let’s go finish the job and bring home that hardware, and of course, the prize-winning purse. While the top 15 overall fantasy football scoring leaderboard was dominated by some of the most notable names in the NFL last week, there were quite a few sleepers in the mix as well. Nick Mullens (1.2), Marcus Mariota (4.3) and Jameis Winston (42.7) are all being started in fewer than 50 percent of ESPN Fantasy leagues this week and finished amongst the top 15 most productive players for Week 13. 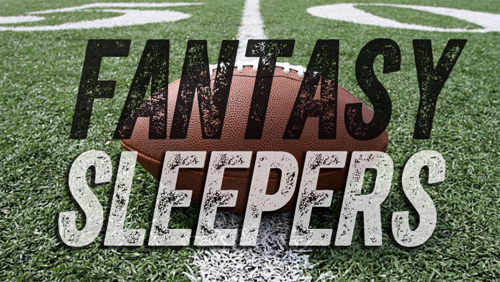 For the purpose of this article, any player with less than a 50 percent start-percentage at ESPN Fantasy will meet the criteria of eligibility to qualify as a sleeper despite their notoriety. I was on a nice little run there for a few weeks but descended back down to earth in Week 13. Once again, Jameis Winston showcased why he should NOT qualify for my sleepers column with another middling QB1 finish. I will continue to feature him until everyone out there begins to see the light. He may not be the best NFL quarterback, but he’s a hell of a weekly play in fantasy as long as he’s the starter and especially when he isn’t turning the ball over. Case Keenum burned me and everyone else. I think it is time to move on from Keenum in fantasy. If you can’t produce against the Bengals, then when? Gus Edwards just missed double-digit fantasy points for the third straight game accumulating 8.2 points in both formats. While T.J. Yeldon didn’t do very much in standard, he did return double-did points in PPR for the ninth time this season. Both Chris Godwin and Adam Humphries finished as WR1s in PPR scoring formats and were by far my best calls. While D.J. Moore didn’t go off, he managed to finish Week 13 with 10.5 PPR points. Although there have been some growing pains along the way, Moore is emerging as the Panthers’ top receiving threat not named Christian McCaffrey. Both of my tight ends were disappointments as the position continues to be a crap shoot on a week-to-week basis. The following is a recap of the players from my Week 13 Fantasy Football Sleepers article. You can read that here. Entering Week 14, some fantasy owners may be forced to shop the waiver wire due bye weeks and a handful of notable injuries from around the league. With players that include Matt Breida, Greg Olsen, and James Conner all succumbing to injuries last week, some more significant than the others, be sure to check out Andrew Erickson’s Waiver Wire Pickups for Week 14 to help you fill the vacant holes on your fantasy rosters. You can read that here. Heading into the 2018 NFL Draft, I was extremely high on Josh Allen. In fact, he was my top-ranked prospect at quarterback. However, since he fell to the Bills, I back peddled on Allen due to the lack of supporting personnel. While Allen had an erratic start to his rookie year, he flashed in an impossible win over the Vikings back in Week 3. Although he only threw for a 196/1/0 stat line, he also rushed for an additional 39 yards on two scores on 10 carries. Following his outstanding showing, Allen not only had a setback on the field, but he also had one off of it. Sustaining an elbow injury in a Week 6 loss to the Texans, Allen would miss the next four games of the season. Upon his Week 12 return against the Jaguars, no one was giving Allen or the Bills a shot. After all, while the Jaguars are having a terrible year, they still have a pretty good defense. Allen didn’t get the memo. Although Allen only completed 8-of-19 passes for 160 yards and a touchdown, he also added an additional 99 yards and a TD on seven carries. Not only did Allen lead the Bills to the win, but he also finished Week 12 as the QB6 with 26.3 fantasy points. Allen wasn’t done. He followed up his fantastic Week 12 outing with another big game in Week 13. Although the Bills lost the game — this one is on Charles Clay — Allen still managed to complete 18-of-33 passes for 231 yards, a touchdown, and an interception. Similar to Week 12, Allen also gashed his opponent with his legs, rushing for 135 yards on nine tries. Finishing Week 13 as the QB2 with 28.7 points, Allen has now strung together back-to-back top-level QB1 performances. While Lamar Jackson, Dak Prescott, Cam Newton and Mitchell Trubisky’s floors are raised due to their rushing ability, Allen should very much be a part of that discussion. Touted a big-arm quarterback out of college, it seems like his rushing ability was overlooked. In eight games this season, Allen has rushed for 389 yards and four sores on 57 attempts. Allen will take is positive momentum into a favorable Week 14 matchup with the Jets. Although the Jets are only yielding the 17th most fantasy points to enemy QBs at a 17.3 FPPG pace in 2018, they have surrendered 21.2 percent more fantasy points to QBs above the 16.8-point league average over the past three games which includes a shocking 17.3-point showing to Matt Barkley in his only start for the Bills this season back in Week 10. If Barkley could throw for a 232/2/0 stat line against this same defense, I think it is a pretty safe bet that the white-hot Allen could at least replicate. Facing a Jets defense surrendering at least 19.2 fantasy points to the opposing QB1 in six of the past nine games, Allen will bring fringe QB1 upside or better into Week 14. How high on Allen am I? I’ll tell you. In the Gridiron Experts 12 team IDP staff dynasty league, I am in the playoffs and have to start Allen, Aaron Rodgers or Kirk Cousins. I’m heavily considering starting the scorching rookie over the iced cold veterans. In an exceptional matchup this week against the Panthers, I expect Baker Mayfield to bounce back from a tough showing in last week’s loss to the Texans. While Mayfield threw for a career-best 397 yards, he only accounted for one touchdown and three interceptions. Despite the big yardage total, the exciting rookie proved to be human with his three picks after accumulating at least 17.9 fantasy points in four of his past six games including three games with at least 20.9 points. However, despite the letdown, you might have to give him a break. While he lit up Tampa Bay (20.9), Atlanta (22.6) and Cincinnati (25.9) in that timespan, he didn’t play as well against Pittsburgh (14.1), Kansas City (17.9) and Houston (14.3). It seems like he exploits the terrific matchups and struggles in the tougher ones, which is to be expected from a rookie. The fact that he actually plays well in the plus matchups should be noted and praised. Some players won’t even give you that. The 10th-ranked QB in air yards per attempt (4.2), ninth-ranked QB in deep ball attempts (51) and the seventh-ranked QB in deep ball completion percentage (43.1), Mayfield will take his recent success into another favorable matchup with a Carolina defense giving up the 6th most fantasy points to rival QBs at a 20.2 FPPG rate. While the Panthers have been bad this season, they have been increasingly forgiving in the past five games where they’ve surrendered 37.8 percent more fantasy points than the 17.1-point NFL average in that same time period. Mayfield, who has thrown at least two TD passes in five of his past six games, should get back on track against the reeling Panthers, who have allowed 1,379 yards passing and 14 TDs while only snagging two only two picks since Week 9. Entering a game with a 47-point consensus over/ under, Mayfield holds fringe QB1 upside in a highly-anticipated Week 14 duel with Cam Newton. While Kenneth Dixon handled eight carries for 37 yards rushing and caught his only target for a six-yard reception, I like both Gus Edwards and Ty Montgomery this week from the Ravens backfield. Although Edwards only managed 8.2 fantasy points last week, he still rushed for 82 yards on 21 carries. The workload is there. I believe Edwards’ letdown was more of a game-script thing than anything else. After all, he did rush at least 17 times for 115 yards in each of the two games previous to Week 13. And with Alex Collins out, there would need to be a tremendous regression from Edwards for him to lose control of the featured spot on Baltimore’s RB depth chart. The Ravens have won their past three games since Edwards became the starter. 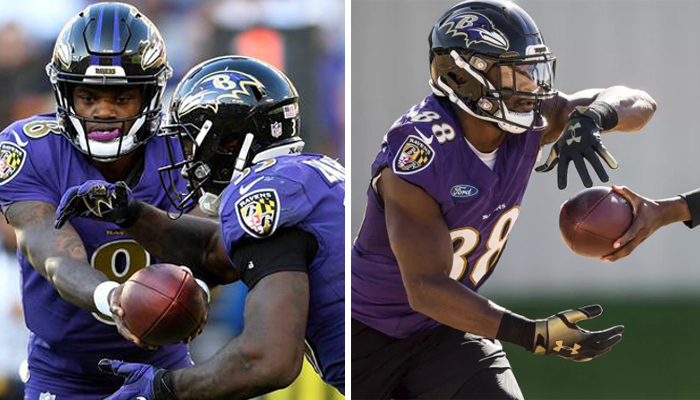 Edwards wasn’t the only change the Ravens made in their backfield, however. After trading for Ty Montgomery at the trade deadline, it took the exiled Packer a few games to get acclimated with Baltimore’s system. And in the past two games, it appears that the converted wideout has taken control as the primary receiver out of the Ravens’ backfield, frog-leaping Buck Allen, who disappeared after his great start to the year. Montgomery has scored at least 9.4 PPR points in each of the past two games since Week 12 while totaling 19 touches (8 receptions) and 119 yards (55 receiving) in that timespan. In their upcoming matchup against the Chiefs, I expect both Edwards and Montgomery to be busy. If the Ravens want to try to make it a game, they’ll not only have to lean on their defense to slow one of the league’s most explosives offenses down, but they’ll also have to lean on their rushing attack in an attempt to control the clock and keep Pat Mahomes on the sideline. In that scenario, Edwards could see north of 20 carries facing a Chiefs defense yielding the third-most fantasy points to opposing RBs at a 25.5 FPPG rate. It also wouldn’t surprise me if Montgomery saw double-digit touches in the game as well. With Montgomery on the field as the change of pace option, the Ravens could use his explosive skill set in the passing game, which helps out Lamar Jackson a ton. While Jackson has played well in this three-game stretch, most of his quality production is coming as a rusher. Still needing to work on his passing mechanics, Jackson completes quite a few low-percentage passes, which bodes well for Montgomery’s fantasy outlook. Montgomery will serve as Jackson’s primary check-down option facing a Kansas City defense allowing a league-high 795 receiving yards and six receiving TDs to enemy RBs while ceding the third-most receptions (81). Surrendering at least 12.4 PPR points to eight different RBs in the past five games since Week 8 — Phillip Lindsay (20.2), Devontae Booker (14.1), Duke Johnson (29.6), Nick Chubb (16), David Johnson (37.3), Todd Gurley (12.4), Doug Martin (14.7), Jalen Richard (15.6) — both Edwards and Montgomery should return a double-digit-point floor respectively. While Edwards is a fine play in both standard and PPR scoring formats in Week 14, I am only recommending Montgomery for PPR. While Austin Ekeler will be the featured back for the Chargers while Melvin Gordon is out with his knee, Justin Jackson is quietly emerging into a prominent No. 2 role. 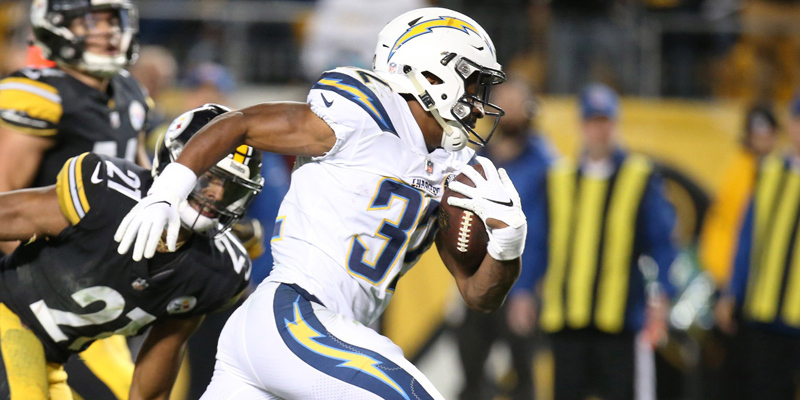 Although Jackson only rushed for 57 yards on seven carries in Week 12 following the Gordon injury, he had another fine showing on minimal opportunities last week. Rushing eight times for 63 yards and a touchdown — he added a 19-yard reception — Jackson finished Week 13 with 14.2 fantasy points. In addition, the uprising rookie has also averaged at least 7.9 YPC in each of the past two games on a minimum of seven tries. Jackson is picking up chunk yards, which bodes well for his fantasy outlook this week against the Bengals. Despite the presence of Ekeler, Jackson should produce facing a Cincinnati defense yielding the most fantasy points to TBs this season at a rate of 27.4 FPPG. And since the Bengals are surrendering 53.4 percent more fantasy points to enemy RBs above the 25.6-point NFL average, there is more than enough production to go around for both Ekeler and Jackson to return double-digit performances. However, since Ekeler is also banged up with an ankle injury, there is a good chance that Jackson sees the bulk of the touches. After all, the Chargers are in control of their own destiny and the last thing they want to do is risk further injury to their terrific RB2, especially with their starter already out this close to the end of the season and with the playoffs on the horizon. Facing a Cincinnati defense that has given up at least 17.1 PPR points to the top-scoring enemy RB in eight of the past 10 games, Jackson could return back-end RB2 upside for Week 14. Kerryon Johnson has yet to practice this week making him a longshot to play in Sunday’s tilt with the Cardinals. With Johnson expecting to miss his third straight game, the bulk of the early-down running back carries should once again trend to the direction of LeGarrette Blount. In the past two games minus Johnson, Blount had managed at least 16 carries for 61 yards, which was his totals in last week’s loss to the Rams. While he struggled last week, Blount went off in a tough Week 12 matchup against the Bears, trampling one of the top run defenses in the NFL for 88 yards and two TDs on 19 carries back on Thanksgiving. Blount, who has played well in back-to-back negative matchups, should get back on track from a fantasy football perspective facing a Cardinals defense surrendering the second-most fantasy points to RBs at a 25.5 FPPG pace. Not only is the Arizona defense yielding 31.1 percent more fantasy points than the 24.6-point league average in the past three games, but they have also given up 369 yards rushing and four TDs on 77 carries while adding another 141 yards on 24 receptions collectively in that timespan. Facing a Cardinals defense that has allowed least 15.2 PPR points to three different RBs since Week 11, Blount is a touchdown-needy Flex option for Week 14. I am going all-in on both Chris Godwin and Adam Humphries for the second week in a row. With DeSean Jackson out last week, Godwin drew the start and went bonkers catching 5-of-6 targets for 101 yards and a touchdown. That being said, Humphries also had a pretty nice game hauling in 7-of-9 targets for 61 yards and a score. Exploiting a great matchup with the Panthers, Godwin and Humphries both finished as top 13 wideouts for Week 13. While it looks like Jackson could miss his second straight game with a thumb injury — there were reports that the Buccaneers could shut him down for the rest of the season — his absence will once again open up the door for both Godwin and Humphries to receive a plethora of targets. Although Humphries can still see enough opportunities with Jackson in, Godwin is the main beneficiary of the veteran speedster’s absence. Since Humphries is a primary slot receiver, he actually benefits from O.J. Howard’s vacancy with intermediate routes over the middle. After putting up big games in a plus matchup with the Panthers, the duo of Godwin and Humphries will get another fine opportunity on Sunday against the Saints. Although the New Orleans defense has played well this season, their handicap is in their secondary. Giving up 30.8 FPPG, the Saints are ceding the most fantasy points to enemy WRs. In fact, the Saints have allowed 11 different WRs to finish with at least 11.2 PPR points against them in their past six games since Week 9. Since both Humphries and Godwin are in line to draw fruitful WR/CB matchups with P.J. Williams (139th ranked CB) and Eli Apple (92nd ranked CB) respectively in a projected shootout with a 49.5-point over/under, I expect the pair of Tampa Bay wideouts to exceed double-digit PPR fantasy points for the second straight week. 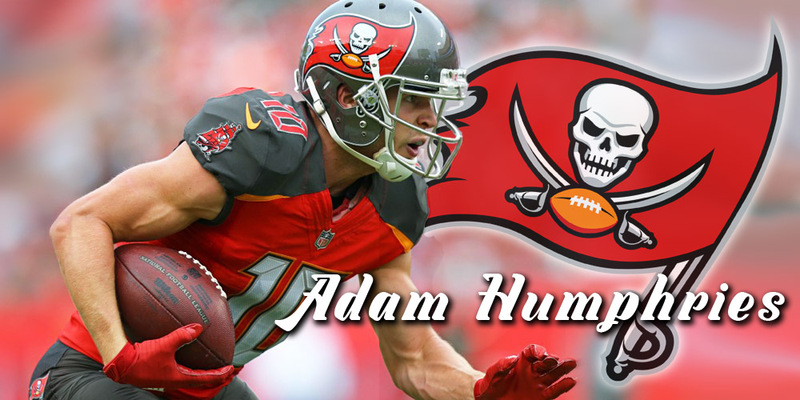 Both Humphries and Godwin are appealing PPR Flex options with WR3 upside or better for Week 14. 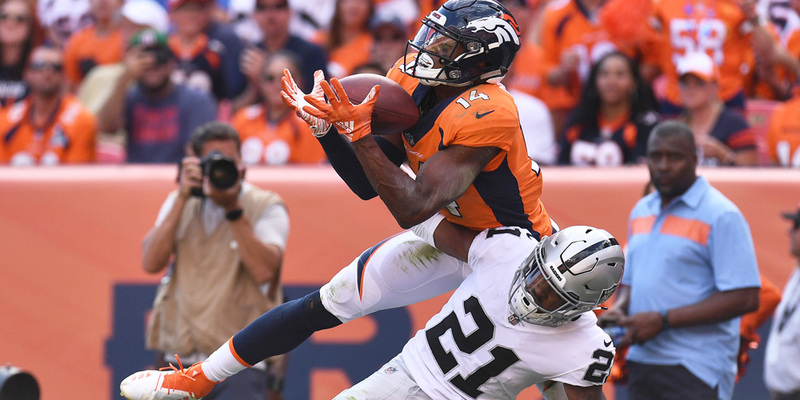 With Emmanuel Sanders out for the rest of the year with an Achilles injury, Courtland Sutton is in line for an expanded role for the rest of the season. In fact, he will be the Broncos’ WR1. And coming off of a Week 13 outing in which he accumulated career highs in targets (seven), receptions (four) and yards (85) — he also scored — what better time for Sutton to come into his own than now. With no other veteran option outside of Andre Holmes, who was just signed this week, to speak of on the Denver wide receiver depth chart, Sutton will lead a cast of unknown rookies that include Tim Patrick and DaeSean Hamilton. If Sutton drew north of 10 targets this week, it really wouldn’t be a surprise. And what better time for Sutton to be featured than in Sunday’s matchup with a 49ers defense allowing the third-most fantasy points to WRs at a 27.2 FPPG rate. While the San Francisco secondary has played well at times this season, they have given up 38.1 percent more fantasy points above the 34.1-point league average in the past three games. In that three-game timespan, the 49ers defense has allowed eight TDs to six different wideouts. And while he is expected to draw a tough WR/CB matchup with the No. 23 ranked cornerback Richard Sherman, Sutton is poised to see enough volume to perform at a high-level. In an offense powered by rookies riding a three-game winning streak, Sutton is an upside WR2 for Week 14. If the Broncos intend to make a playoff run Sutton must be a tremendous part of it. 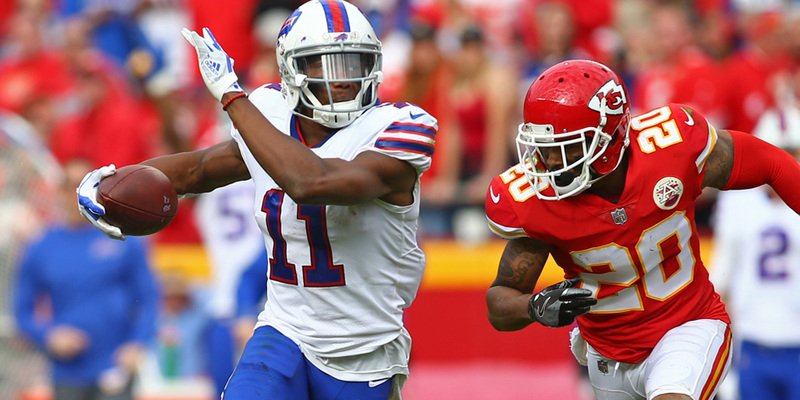 Despite a letdown against the Jaguars in Week 12, Zay Jones has played well in two of his past three games dating back to a plus Week 10 outing against the Jets with Matt Barkley under center. Catching 8-of-11 targets for 93 yards and a TD, Jones finished Week 10 with 15.3 PPR points. 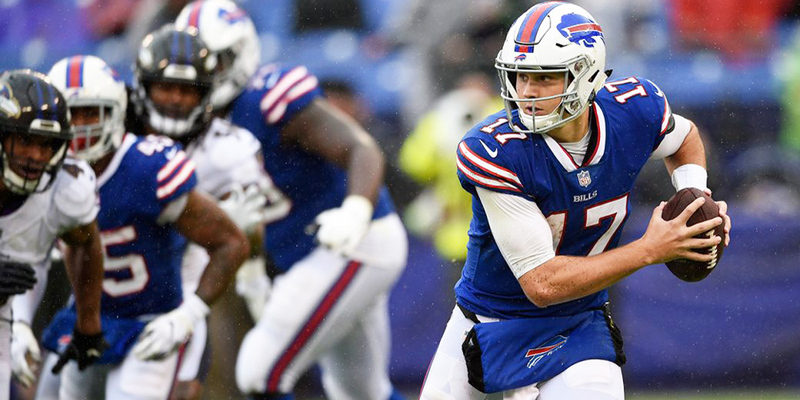 And while Jones failed to catch his lone Week 12 target against the Jaguars, the second-year wideout bounced back in a big way with a 4/67/2 stat line on nine targets from the arm of Josh Allen. Despite the Week 12 zero, it is safe to say that this has been Jones’ most-productive three-game time period of his two-year career. Now, Jones will look to build off of his momentum and budding rapport with Josh Allen in a favorable matchup with a Jets team he torched with his aforementioned 8/93/1 stat line a few weeks ago. And since the Bills moved on from Kelvin Benjamin and Andre Holmes earlier in the week, you can make the case that the organization likes what they see from Jones and wants to feature him more down the stretch. After all, it’s not like they were going to retain Benjamin and Holmes in 2019, so why not put Jones out there to see if he can be a true WR1 with Allen under center. Facing a Jets defense yielding the eighth-most fantasy points to WRs at a 26.2 FPPG pace — they’ve allowed the top-scoring enemy wideout to accumulate at least 14.4 PPR points against them in each of the past three games — Jones is a target-dependent Flex option who could return WR3 upside or better if he scores in Week 14. The Allen-to-Jones connection could certainly be a thing for the remainder of the season with the Lions (Week 15), Patriots (Week 16) and Dolphins (Week 17) on tap for the last three games of the year. Greg Olsen suffered yet another season-ending foot injury in last week’s loss to Tampa Bay and for the second time this season, Ian Thomas was unexpectedly thrust into a featured role. While Thomas didn’t play well earlier in the year when Olsen was out — he caught fewer than three passes for 38 yards in each of the first three starts of his career from Weeks 2-to-5 — it seemed to click for the 101st pick from April’s NFL Draft this time around. Catching all five of his targets for 46 yards, Thomas compiled the best game of his career in spot duty. Although he didn’t go off or score, Thomas will look to build on his career-bests in an exceptional matchup with the Browns on Sunday. Facing a Cleveland defense giving up the eighth-most fantasy points to TEs at a 9.0 FPPG rate, Thomas could finally score for the first time in his pro career. Not only is the Browns defense allowing 67.3 percent more fantasy points than the 12.4-point league average in the past five games, but they have also allowed a combined 31/281/4 stat line to enemy TEs in that time period. Moreover, the Browns have also allowed a four different rival TEs to accumulate at least six receptions for 39 yards or a TD in the past five games. In a potential shootout with a 47-point over/ under, Thomas is a top-end TE2 with scoring upside for Week 14. I’m taking a chance here with Saints TE Dan Arnold this week. While Ben Watson is slated as the starter, he has accumulated fewer than three fantasy points in five of his past seven games. Moreover, Watson has only hauled in 5-of-8 targets for 83 yards and a score combined in his past three games. In that same three-game timespan since Week 11, Arnold caught 8-of-10 targets for 90 yards and a TD. Albeit is by a small margin, Arnold has out-targeted and out-produced Watson. Although Watson is also out-snapping Arnold in each of the past three games, Arnold has run more routes than the latter in the past two. if you’re not running routes, you’re not accumulating fantasy production if you’re a WR or TE. It is that simple. Facing a Buccaneers defense surrendering the fourth-most fantasy points to TEs at a 10 FPPG pace — they’ve allowed five different TEs to finish with at least 8.2 PPR points in five games since Week 9 — Arnold could finally emerge at an underwhelming tight end position for the Saints. Arnold, a converted wideout, is a dart throw TE2 for Week 14 who might need to score to return value. Thank you for reading my Week 14 Fantasy Football Sleepers for 2018.